While you're checking in, check out the 20,000-gallon saltwater tank behind the front desk. The indoor coral reef is home to approximately 450 fish from 85 different species of finned and gilled glory. These fish species were all selected for their adaptability to the environment and compatibility with other species. One of our most popular attractions is the aquarium located behind the front desk. This 20,000-gallon saltwater aquarium is home to angelfish, puffer fish, tangs and other exotic sea creatures. 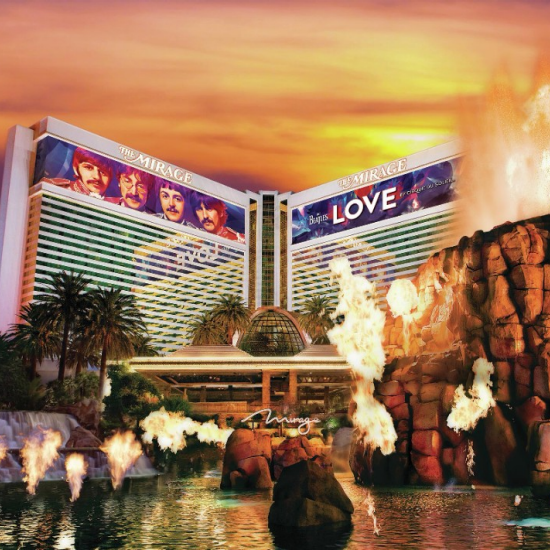 After a two-month transformation, The Mirage's famed lobby aquarium - already one of the most elaborate and technically advanced in the world - now offers visitors a new sensory escape. Several of the top aquarium design experts collaborated to create the ultimate undersea environment. The interior was carefully created to simulate an intricately detailed, coral reef. To preserve the living reefs in the ocean, no live coral is used in the tank. The aquarium's filtration and life support systems were also updated with technology that will improve visibility and support new artificial corals and nearly 1000 specimens. This 20,000 gallon spectacular is home to new, brighter artificial corals that call to mind the exotic beauty of such tropical locales as Australia's Great Barrier Reef. In order to protect the environment it celebrates, The Mirage donated the exhibit's old reef system to the Las Vegas Natural History Museum. 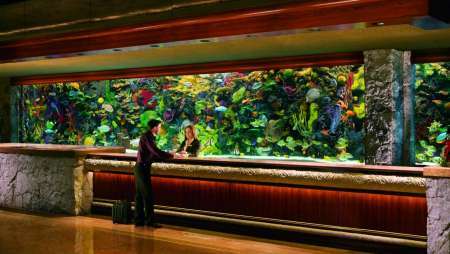 The Mirage Lobby Aquarium is located directly behind the front desk. Managed by The Mirage's own in-house aquarists, the aquarium is cleaned 2-3 times a week as the aquarium staff suits up and dives into the tank. Divers can be seen early in the morning as they scrub the corals, wipe the acrylic window, and siphon the gravel. This maintenance helps keep the water healthy for the animals and maintains an aesthetically pleasing view. In December of 2011, Sherman's travel ranked The Mirage Aquarium 7th in the world for best hotel aquarium. The aquarium is 53 feet long, eight feet from top to bottom, and six feet from front to back. The acrylic used in the aquarium is 4 inches thick. There are approximately 450 fish from 80 different species residing in the aquarium; they come from around the world from tropical places such as the Caribbean, Red Sea, Pacific Ocean, Indian Ocean, and the Indo-Pacific. All of the coral in this aquarium is artificial because live coral is very delicate and grows at a slow rate, about 1 inch per year. The Mirage aquarium is one of the most visited and recognizable aquariums in Las Vegas and is a highlight of The Mirage property. So next time you’re at The Mirage take a few minutes and acquaint yourself with the truly amazing fish that are being displayed. Walk into the Casino and walk towards the Front Desk. The aquarium will be on your left.